Here's this week's show. I gotta drive to LA to get a passport so we can go away on Friday to Canada, so can't spend much more time jammering. No show for the next two weeks, but this is 2 hours, so pace yourselves! Click on the date below to make it play or right-click to save it and listen at your leisure. You can subscribe, too, (it's free!) in iTunes or in Zune. Could there be a better way to kick off a new year than with Mr. Las Vegas himself, Mr. Wayne Newton? The Wayner needs little introduction, so let’s just say that you’re about to hear the answer to all your questions including whether he’s had plastic surgery, what he thinks about his weathered voice and much more. Newton, who is performing at the Tropicana at least through April, also addresses his Norm Clarke plagiarism flap, explains how he recovers memorabilia stolen regularly from his Vegas home and for the first time ever reveals the scene from Vegas Vacation that he had nixed. Plus, is his Trop show profitable? What does he think of others who call themselves Mr. Las Vegas? Why doesnt' he want to see Viva Elvis? What was it like to meet Howard Hughes? And much more. In Banter: Garth's amazing, NYE on the Strip, the Cupcakery and more. Four days ago, I left a theater in Vegas feeling staggered, stunned, disoriented and completely unsure of how what had just occurred had made such a deep, profound impact on me. Even now, I’m a bit in awe that the feeling hasn’t left me, that my mind still moves from one choice moment to another. So let me just come right out with it: Garth Brooks’ performance at Wynn Las Vegas last Friday was the single best thing I have seen on any Vegas stage ever. Yes, ever. More magical than any illusionist, more dazzling than all things Cirque, more satisfying than even my favorite of our litter of Broadway imports and certainly, by a large measure, more emotionally pleasing than anything any of the A-plus-list headliners at the Colosseum at Caesar Palace have produced. I don’t tend to use this space for show reviews, but when something rises to this level of awesome it occurs so infrequently as to be worth examining in some detail. And what went on in that showroom last week—and what I suspect occurs every night of Brooks’ 300-show, five-year commitment to Steve Wynn—transcends the bombastic affair that a concert has become nowadays. In short, this is something we’ve never seen in Vegas. It’s 1,500 friends around a campfire with one of the greatest performers of our time and he’s doing whatever he wants and whatever we want and everyone knowing they must savor the ephemeral moment. Gays: Vegas is No. 1! Well, sorta. In a few ways. The 14th annual Community Marketing Inc. survey of the travel habits of gays and lesbians was released yesterday. You can download it here. There are significant flaws in the methodology of this study, namely that there's no way to know what the demographic universe of all gay people are because so many are closeted, would never respond to surveys, may not even self-identify as gay or other reasons. All of this is acknowledged by CMI. But this study of 7,078 GLBT volunteer respondents -- about 4,000 of whom live in the U.S. -- is, nonetheless, extraordinarily influential and no more so than here. 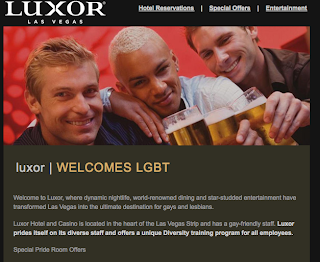 Its findings earlier this decade that gays and lesbians heart Las Vegas as much or more than New York and San Francisco was directly responsible for the decisions of MGM Mirage, Harrah's, Wynn Resorts and the Las Vegas Convention and Visitors Authority to begin the aggressive GLBT marketing efforts we've witnessed. These efforts appears to have really paid off among this polled set. When respondents were asked to fill in a blank for in the destination that they felt had done the best job in outreaching to the LGBT community, Las Vegas was No. 1 with 11%, followed by San Francisco at 10%, Fort Lauderdale at 7%, Philadelphia at 6%, Provincetown at 5%, and London at 5%. It gets better for Vegas -- and worse. Vegas was No. 2 in leisure travel behind New York and AHEAD of San Francisco, L.A. and Chicago and also No. 2 among gays and lesbians over 62 and between 18 and 32. However, Vegas is not even in the top five for business travel and that's surprising given that the city's convention business overall dwarfs those on the list and, in fact, all other U.S. convention destinations. The sheer numbers of all people who come here for business meetings alone would seem to demand that Vegas end up among the leaders in this segment. This is a city with not a single lesbian bar. In my capacity as a blogger, podcaster, travel journalist and author of the only gay guidebook ever written about Vegas, I rarely hear from lesbians asking questions or making comments about Vegas matters. So my sense is that this outcome is suspect. Could it be a combination of the fact that only 25 percent of the respondents were lesbians and that a plurality (13 percent) of the total respondents from the U.S. live in California? We'd then be looking at a very small pool of lesbians, of which a large portion would be coming from the nearest state to Vegas? Could that also explain how Vegas can outrank uber-gay San Francisco because, perhaps, a lot of respondents actually live there and thus wouldn't go on vacation there? There were some contradictions embedded in the study's outcome, too. For example, CMI reported that "going to neighborhood restaurants and visiting the gay neighborhood were the top activities enjoyed by gays and lesbians when visiting a destination." So how does Vegas do so well when all we have are a pair of small gay bar districts and no gay ghetto, just as the city has none of the other ethnic or cultural neighborhoods. Chinatown, for instance, is a series of Asian-themed strip malls, not where Asian people actually live. Same for the gays. If this is the top motivation for gay travelers, they're not finding it in their second-favorite destination. But the flip side of this is more support for a contention I've made for years that Vegas is the ultimate post-gay destination, the place where gays -- like everyone else -- come for a mainstream vacation. 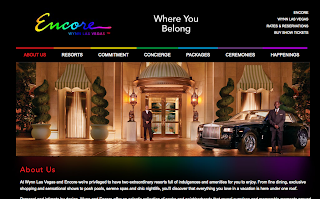 The Strip has lots to appeal to the traditional interests of, at least, gay men -- Broadway shows, male revues, high-end shopping, fine dining, luxurious spa experiences -- and can appeal to gays like Miles and myself who do not seek a "gay" experience when we travel. We just want to enjoy the same things as everyone else. What all of this adds up to is unclear. I recall prior years' surveys coming up with similar findings including the strange Lesbians-Heart-Vegas stat, which isn't surprising when you realize that Community Marketing Inc. says respondents come from a database they've compiled. So it could very well be the same people being asked the same questions year after year. So take this material for what it is. As I said, I wouldn't invest too much stock in it except that the LVCVA and others really do. Should Planet Hyundai Pay For Its Mistakes? OK. I've got a situation. I'm going to lay out the facts. I'd like some honest feedback including, if appropriate, disagreement. My car was in the shop when the courthouse shooting occurred yesterday, so I ran to a nearby local Avis office and grabbed some wheels to cover it for The New York Times. Then I somehow lost the keys to the rental car and had to have it towed back to Avis. The Avis fellow told me he'd find out by today what has to happen. He called late this afternoon to said the Avis corporate peeps claim they must have the Hyundai Elantra towed to their airport location for rekeying and that the whole thing was going to cost more than $400. Even my local Avis dude thought this was stupid and extortionist and it dawned on us that I could get another set of keys made myself at a Hyundai dealer using the VIN number and my rental contract. Sadly, the Hyundai place that was 5 minutes away closed up suddenly this week. So I drove clear out to the other side of town, a good 25 minutes, to get a pair of keys made. Then I headed back to my Avis place, arriving by 5:10 p.m. My Avis dude had told me that if I got it back before 6 p.m. when they closed, he wouldn't have to charge me another day. Ah, but the keys made by Planet Hyundai did not work. I called to ask them why. The technician was surprised and said he thought maybe his key-making machine was broken. He suggested that, rather than returning to him and chancing another error, I ought to go to the other Hyundai location, way down in Henderson, because they had a different machine. Thus off I went on a 25-minute drive south. At Henderson Hyundai, they detected the problem. The guy at Planet Hyundai had used the wrong key blank. Now it was after 6 p.m. I am responsible for another day of rental, another $50. I called Planet Hyundai to ask for my refund. I was told I'd need to bring the keys back before I could have one. This was silly and time-consuming, seeing how I'm now a solid 35 minutes from them and I live a good 25 minutes from them. The manager told me there isn't any way for him to know if the keys were incorrect without having them back, which is to say that he is incapable of calling his counterpart at Henderson Hyundai to confirm this. That would save me even more inconvenience than they've already caused me, but that would be, how do we put it, good customer service. Which is not Planet Hyundai's gig, evidently. So now I must drive across town again for a refund when all he has to do is void my credit card charge. It's done thousands of times every single day. He thought this was ridiculous. OK. He's happy to cause me this trouble on top of the rest of it. Whatever. But then what about my rental car? Does Planet Hyundai also owe me to cover the extra rental car day? The manager thought this was the most ridiculous thing he'd ever heard. Because of Planet Hyundai's error, I will have had to drive an extra 50 miles, spend an extra three hours and pay for an extra day on a rental car. Those are facts. So, should Planet Hyundai pay for the rental car?